I sat on the worn 70s vintage red striped couch, tired from a day of swimming, muching popcorn and watching The Jetsons. 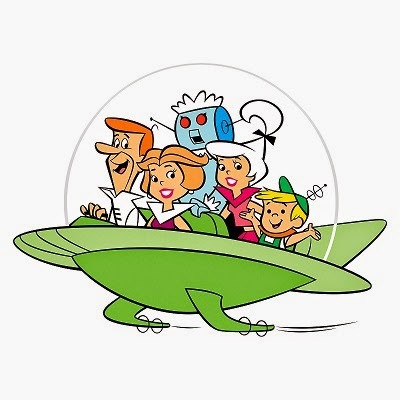 To a young tinkerer (and admittedly sometimes lazy individual), the draw of our bubble-housed, flying-car, robot-vacuuming future was inescapable. I had no doubt that one day my bed would tump me out on to the morning conveyor belt to an automatic shower and insta-breakfast while my robotic maid straightened my room. (To a twelve-year old boy, that last one was a biggie). A few decades later, I still have to make my own bed and I don't fly to work, but my home is getting smarter bit by bit, thanks in no small part to a little white box tucked away in a bookshelf cabinet. The box, a $99 gadget from SmartThings called the SmartThings Hub, was set up in under 10 minutes, and connects all sorts of home automation devices to a service that lets me control and monitor them from anywhere using my phone or tablet. They offer tons of switches, dimmers, and sensors on their site. Each has a video showing exactly how to set them up- typically a simple one-minute process. By answering a few questions in the app, I can then add smarts to my home to automatically turn things on and off, alert me to various conditions, and take action for me. I can control my lights (and soon, garage door) from my phone, from anywhere. Did I forget to close the garage? My house notifies me and one tap later I close it while I'm out fishing. Whenever my wife and I both leave the house, my house knows and turns off lights. If there's motion while we're away, it notifies us. When we come back, it can turn on lights as well. When there's no longer any motion in the living room, it turns on the bedroom fans and turns off any lights that were left on. I'm brewing beer, and SmartThings logs the temperature at the fermenter to ensure a consistent temperature. Next on my list of things to automate are several more lights, locks, garage door, and watering. What impresses me the most with SmartThings is that after the novelty of controlling lights from your phone wears off, it's still bringing intelligence and value to our home. If this sounds a little nerdy - well, it is. But, I also think it's the "next big thing" in technology. Think smartphones before everybody had them. Already, the media hype engine is revving up around the "Internet of Things" and various big-name players are jumping into the market. What sets SmartThings apart, though, is that they play well with lots of different systems and do not require a monthly fee. I can pick up a ZWave switch at Lowes, or a Phillips Hue bulb and the system sees it just fine. Similar systems I've tested either require a monthly fee, or are not as polished. Disclaimer: I'm using a referral link to SmartThings, but it's a good deal. You get 10% as a new customer, and I get $10 to automate my next thing. Good stuff! I'm curious if the temperature sensor is inside the fermentation vessel or how did you accomplish this? No, I just have a temp sensor right next to the fermenter. In this case, it just confirms that the temp in my "brew closet" is an even 70 degrees F. In colder months I might try adding a warming pad on a ZWave outlet so that it warms things up when they get too cold. I used your referral link to purchase my smartthings hub, I hope you received credit and enjoyed it. I am looking into the following indigogo campaign. With 5 referrals I can get it free, you can as well with 5 referrals. Please check it out and share and return the favor! Thanks! @John - I did notice on my last purchase I had a credit. Thanks, and I hope you're enjoying ST! I'd not heard of Luna, but it looks pretty cool. A smart sleep monitor and wake-up lamp has been on my list for a while, and the temp control would be nice. I may just have to jump on that. Thanks for the tip! Home security is one of the topmost concerns among people across the globe these days. Keyless lock systems have emerged as a great solution. Keypad door locks have attained great popularity among consumer these days. Secure Tech providing the door locks system, to know more details please visit us.